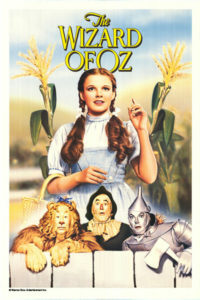 Wizard of Oz coming to the Astra on June 2! The 1939 classic Wizard of Oz will be screened at the historic Astra Theatre on Saturday, June 2, 2018, at 7 p.m. Tickets are $8 and can be purchased in advance online by CLICKING HERE or at the door the night of the show. The Greater Jasper Downtown Business Association (the Downtown Merchants) is sponsoring the presentation. Widely considered to be one of the greatest films in cinema history, the Wizard of Oz is, perhaps, most notable for its use of Technicolor, fantasy storytelling, its musical score, and memorable characters. Not surprisingly, it has become an icon of American popular culture. The evening screening is a complimentary piece to the Jasper Community Arts’ 15th annual “Chalk Walk Arts Festival” event earlier that day—a one-day event that includes chalk/pastel murals, hands-on activities, and an arts market with food vendors. The first 100 Chalk Walk registrants will receive a $1 off coupon for the evening showing of Wizard of Oz. For more information or to register for the Chalk Walk, visit the Art Center’s site at www.jasperarts.org. In addition to the June 2 screening of the Wizard of Oz, the Astra is set for its grand re-opening on April 14, a sold out performance by Will Kimbrough and Patrick Sweany. The second event of the venue’s 2018 performance series is a performance by the East Nashville duo Smooth Hound Smith on Saturday, May 12. Tickets are still available for that performance and can be purchased online by CLICKING HERE.